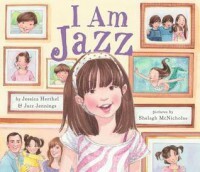 I Am Jazz is a book that follows the story of a transgender girl (an individual born genetically as a male). This book is kid-friendly, stressing the importance of acceptance of all individuals no matter their back story. Because this book follows Jazz through her issues at school and also troubles with herself, this book is great for a classroom that might experience a child who is transgender. I would say this book would be great for any elementary school child, but more specifically 2nd to 3rd grade. Children are very curious and just want to understand unusual circumstances. An activity that could be done with this classroom would be to have a whole group lesson on diversity with this book but show students that really they have a lot more in common than they may think. The students would draw a venn-diagram, the two circles representing the two individuals. The students would complete the diagram based on what they have in common and what are their differences. Overall, this book would be great to introduce a heavy subject in a light, understandable and kid-friendly way.